It is worth pausing to appreciate the unalloyed joy and triumph of the campaigners and the fillip given to gay rights across the globe. In the celebrations that followed the vote it quickly became obvious that the campaigners were not celebrating the victory of gay people alone. This was seen a liberation of young people, of women, of the working class. Working class districts in Dublin voted at over 85% for the measure. Young émigrés returned home in their thousands to cast their vote. They were striking back at an alliance of church and state that had kept workers in servitude and forced young people unto the migrant boat. It was a stunning defeat for the clerics. The referendum was an example of what Marx called the conversion of quantity into quality. The form was of a staid electoral exercise. The content was insurrectionary in character. Although the outcome was expressed in a vote, it had been decided in advance by a whole series of decisions on the streets. By far the most decisive of these were the actions of the LBGT community itself. By simply asserting themselves in civic society, by coming out to family and friends, by mobilizing as a social force, they made the old society impossible. As sexual orientation is no respecter of class, the change was everywhere and the referendum was launched with all the major parties supporting a yes vote. The church launched a formal opposition, but it had already lost. Indeed, after endless revelations about the way in which church and state brutalised women and the poor, the search for revenge became a potent motive for joining the yes campaign. A third element, largely ignored, was the context over the past year of mass mobilizations and skirmishes with the police in some working class areas around the issue of water charging and privatisation. There is a growing revolt against years of austerity, of collaboration with the Troika and against a self-satisfied elite that proclaims recovery while workers struggle to survive. That revolt has yet to find full political expression, but is always threatening to break forth. The ruling class has tried to claim credit for the result with ludicrous assertions about the Irish love of equality while surrounded by a stunningly unequal society where racism and bigotry are openly expressed. On the other hand, premature claims are made about a post-Catholic society. The church has been humiliated, but despite the loss of popular support, retains a key role in sanctifying capitalist rule, within the state apparatus and in key areas such as health and education. A number of issues arise from the referendum. Firstly, can further steps be taken in establishing democratic rights? Specifically can we extend LGBT rights in the North and end the barbarous mistreatment of pregnant women both North and South? Secondly, what mechanisms will be most successful? A broad movement working through state institutions or an activist movement with an insurrectionary flavour? Finally we must consider if these reforms are readily available inside current structures or if it requires a mobilization of sections of the working class to apply pressure. In the case of LGBT rights in the North public sentiment is little different to that in the South. 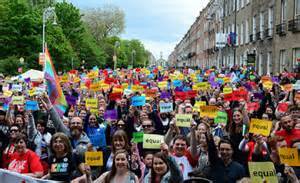 Pride marches are widely supported. However there are two immense obstacles to change. The first is the DUP, the second the undemocratic nature of the institutions that gives the party an absolute veto. There is no chance of the DUP giving way, so the most likely mechanism is a legal challenge to UK courts. Given British reluctance to upset the unionists, mobilizing for reform would clearly be necessary. A major handicap is that many LGBT groups treat the Stormont as a democratic institution, calling on DUP ministers to resign over bigotry while ignoring the party’s programme of prejudice and the institutional veto that the DUP hold. A further handicap is the lack of any generalised mobilization – the trade union leaderships recently collapsed a campaign against austerity while mobilization in the South is still a reality. On the issue of woman’s rights in the South, again there is an immediate issue in that there is no possibility of the major parties supporting reform. Class divisions represent another obstacle, with the well-off able to avoid local restrictions by visiting Britain. Legal and parliamentary campaigns have failed time and again. There is a real need to mobilize and to build a movement for woman’s rights across civic society. The existing movement is weak, and a continuation of current mobilizations by the working class could give immense impetus to its growth. At the moment the Right2water movement lacks a united programme or democratic national structure, yet behind it is a growing anger and determination in the working class areas. They have drawn blood in the decisive victory for LGBT rights. They will be anxious to draw more. Workers, Socialists, feminists, LGBT, should all unite in a democratic and inclusive movement that is willing to step outside the consensus to force change and to give voice to the burning discontent about our imprisonment in a sectarian and undemocratic system offering a future of repression, misery and impoverishment.